In a world where online shopping is just as common as shopping in brick and mortar stores, buying glasses online seemed to be unlikely until recently. Companies like Warby Parker and Tortoise and Blonde are working to change that perception with their offers for $99 complete pairs of glasses ordered online and delivered right to your door. 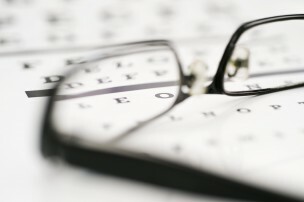 So the question is, why would a patient who just had an eye exam still shop in their doctor’s office for their glasses? First, when you order glasses online you’re missing out on the opportunity to work with a trained optician who can help you find the best style and best fitting glasses. A properly fitting pair of frames is critical to ensuring you can see properly out of your glasses and there’s no one better trained to find a perfectly fitting frame for you than one of our opticians. Second, these online discount retailers sell glasses that are just not the same quality as a pair of glasses purchased at Nipomo Optometry. Consider this: according to the American Optometric Association, half of all pairs of eyeglasses purchased online either fail safety compliance rules or are the incorrect prescription. Read more about the study here. If you ordered a pair of glasses with impact resistant lenses, there is a chance those lenses have not gone through the proper safety inspection to certify they are impact resistant. Or, worse yet, the glasses you’re wearing may not even have the prescription your doctor prescribed to you. Warby Parker states in the FAQ section of their website that they won’t require you to provide a written prescription or even verify that your prescription is correct unless the order is shipping to one of nineteen states that require them to do so. Click here to see if your state is on that list. Our practice offers two year warranties against scratches and breakages on most frames and premium non-glare lenses. And Dr. Palmer also offers a 90 day unconditional exchange guarantee. That guarantee is honored whether you fell out of love with the frame you chose and want a different one, decided to get add Transitions lenses after all or need a prescription change. The trip to Nipomo Optometry to get your glasses may take a little longer than shopping online, but the entire network of staff standing behind those new glasses guarantee the glasses you’re purchasing. And that guarantee is something that a pair of glasses purchased online just doesn’t have.